Going retro is something that happens all the time, be it in the world of fashion or otherwise. Even tech takes a step back in terms of design (but not functionality, mind you). 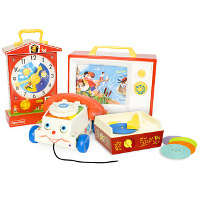 The Fisher-Price Retro Classics that you see here are pretty good examples of a bygone era. We probably think that kids these days won’t even take a second look at the Chatter Telephone, the Teaching Clock or the Turntable/Two Tune TV Music Box with the PSP and numerous other home consoles already having strengthened their grip on your little ones’ lives. Well, all hope is not lost yet if you decide to purchase these early on in your little one’s life. These nursery toys can always be played by you as it brings back fond memories, but don’t let anyone else catch you doing so in your moment of nostalgia! You can bring home the Chatter Telephone, the Teaching Clock or the Turntable/Two Tune TV Music Box for £14.99, £19.99 and £29.99, respectively.